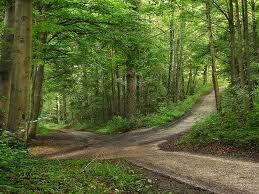 The master says: “A crossroad is a holy place. There, the pilgrim has to make a decision. That is why the gods usually sleep and eat at crossroads. Where roads cross, two great forces are concentrated -the path that will be chosen, and the path to be ignored. Both are transformed into a single path, but only for a short period of time. The pilgrim may rest, sleep a bit, and even consult with the gods that inhabit the crossroad. But no one can remain there forever: once his choice is made, he has to move on, without thinking about the path he has rejected. I pass the crossroad today, and I know it won’t be a curse.